Some birds like handling but others don’t. All birds are enjoyable to watch, listen to and have around. Some birds are great talkers, others have a beautiful song and some bring endless fun antics to each day - all of which can bring a lot of joy to your life! Equipped with knowledge and understanding, you will have a better idea of what to expect. A canary or budgerigar is a particularly good pet for a family with very limited space or modest means. They are suitable for people living alone. The care of these caged birds could hardly be more simple or undemanding, but the individuality they show depends on the degree of freedom they are allowed and on the stimulation provided by their surroundings and their companions. Only the male canary sings and whistles, and the male budgerigar is usually easier to teach to talk. There are important differences (feathers, interaction levels and general behaviour) to be aware of between the genders of each species. Please ask one of our vets regarding a good health care routine. We can discuss and advise you on nutrition including vitamin and mineral supplements (especially during the moult), worming and any other health or behavioural concerns you may have. 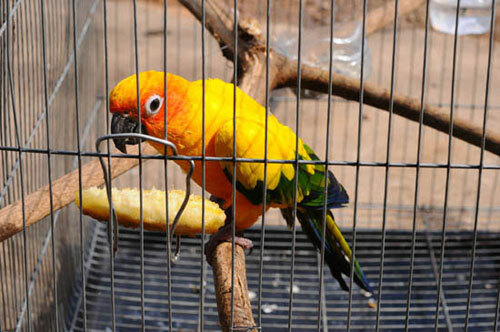 Ladders, bells, ropes, swings, mirrors, and suitable toys provide some stimulation for a caged bird, but avoid over-furnishing as this will crowd the cage and may result in injury. If you are considering a parrot (especially African Greys) a parrot "play-stand" outside of the cage is a great way for improving interaction with owners and enrichment for these highly intelligent birds. The caged bird's basic diet should consist of breed-specific good quality mixtures. This diet should be supplemented with green foods and fruit. Cuttlefish bone should be available in every cage to provide many trace minerals required by birds. Fresh water is essential and must be replenished frequently in hot weather or if it becomes contaminated.